Kraven the Hunter was first introduced into the Spider-Verse in Amazing Spider-Man #15. The much lauded hunter is solicited by his old friend the Chameleon to dispose of Spider-Man. The Chameleon did not think that he was up to the task of taking on Spidey by himself and that Kraven would "relish the task" of taking on a foe like Spider-Man. However, Kraven is unsuccessful and after Spider-Man defeats him, Kraven is deported from the country. Kraven soon returns though in Amazing Spider-Man #34, seeking revenge upon the wall crawler. The hunter impersonates Spidey and attacks J. Jonah Jameson in an attempt to get the real Spider-Man's attention. Spider-Man eventually defeats Kraven again, leaving the hunter webbed up and in police custody. However, it is soon revealed that the events portrayed in Amazing Spider-Man #15 and #34 were not the full story and that Kraven was not working solely for his own sense of accomplishment as a hunter during those attacks. In a flashback sequence depicted in Amazing Spider-Man #47, we see a different recount of events between Amazing Spider-Man #15 and Amazing Spider-Man #34. In fact, the motivation for Kraven to snare Spider-Man was largely due to a $20K bounty the Green Goblin had placed on Spider-Man's head. But since Kraven rationalizes that he is much stronger than Spider-Man and that Spidey's defeat is imminent, he approaches the Goblin's "go-between" and demands half of the reward up front. The front man for the Goblin doesn't budge and suggests that if Kraven wants to renegotiate, he should do it with the Green Goblin directly. Kraven is angered by this refusal and soon swears vengeance upon the Green Goblin as well. Eventually, he tracks the "go-between" and finds his identity to be Norman Osborn. Unfortunately for Kraven, before he can exact punishment on Spider-Man or the Green Goblin he is defeated by the wall crawler as per the events of Amazing Spider-Man #34. 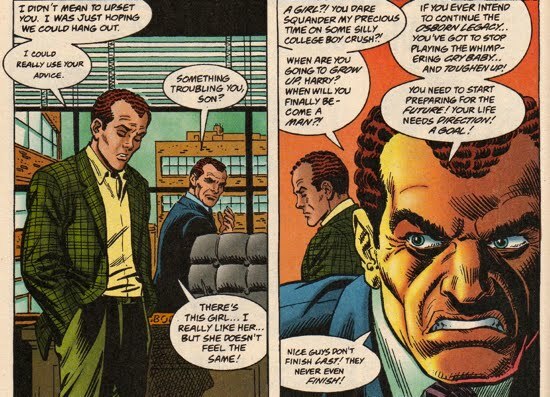 This brings us to the present time in Amazing Spider-Man #47, where a vengeful Kraven seeks to collect from the Green Goblin the money he "owes [him]…for the time [he] spent in jail". To Kraven's dismay, he discovers that the Green Goblin has died in a fire, as seen in Amazing Spider-Man #40. 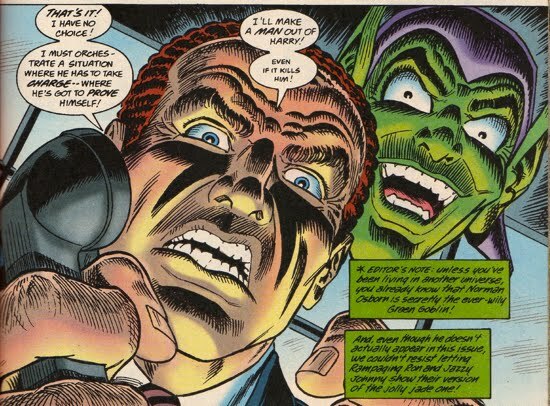 This news leaves Kraven with the only option of demanding the money from the Goblin's "go-between", Mr. Norman Osborn. Kraven is unable to find Norman though, and after threatening Norman's butler, the hunter settles on abducting his son Harry to draw Norman out of the woodwork. Norman soon gets wind that Kraven is causing a stir at midtown and immediately takes a taxi cab to that location. When Norman arrives, he sees Spider-Man battling Kraven, but the hunter immediately recognizes Norman and goes after him instead. However, Kraven soon becomes convinced that Norman does not know anything about the Green Goblin nor the money he owes Kraven. At this point, Norman is still experiencing amnesia regarding his Goblin persona. Kraven claims that he can "sense" when someone is lying, and he believes Norman to be telling the truth. Since Kraven is a man of honor, he will not attack a person that he has no reason to attack, he therefore lets Norman go unscathed. 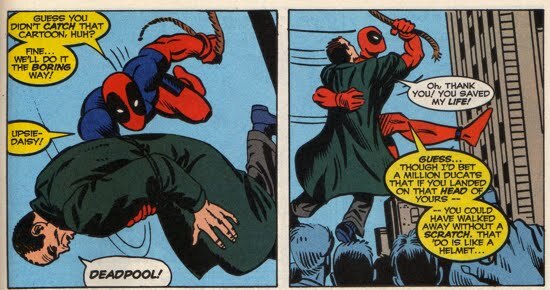 However, before Spider-Man can detain Kraven, he is preoccupied with Norman, who somehow managed to fall from ledge of the scaffold that he was on. Spidey saves Osborn before he plummets to his death and he reunites him with his son. Interestingly, Norman blatantly defends Spider-Man to his friend J. Jonah Jameson, who believes Spidey tried to murder Osborn. 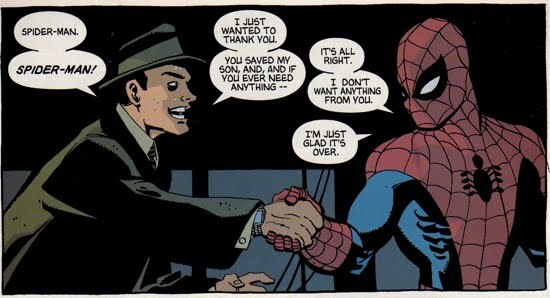 As an aside, in the retconned story Spider-Man: Blue #6, Norman actually thanks Spider-Man personally for saving himself and his son from the madman Kraven. The Kraven-Osborn dynamic gets a little stranger in the DeFalco/Frenz/Romita Sr. retcon story featured in the Amazing Spider-Man 1996 Annual, which takes place some time after the events of Amazing Spider-Man #47. 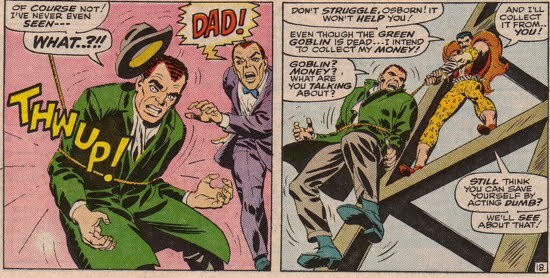 During this time Norman's amnesia regarding his Green Goblin person continued to block his full memory. But the powder-keg that is Norman's psychology was showing signs of a potential eruption. After Harry requests a few minutes of his dad's time to talk about a girl problem (aka Mary Jane), Norman's resurging migraines send him flying off the handle at his son. Osborn scolds his son for wasting his time because of a 'silly college boy crush' then realizes he needs to teach his cowardly son a lesson. Like any logical father, he picks up a phone and hires a handful of thugs to spook Harry and his friends at the Coffee Bean. This is where events get a little difficult to resolve regarding Kraven and his beef with Norman Osborn. As shown above, at the conclusion of Amazing Spider-Man #47 Kraven had given up his vengeful quest against Norman and, in effect, against the 'deceased' Green Goblin. Yet when underground snitch Joey Ears gets wind of Osborn's plot to scare Harry and his friends (remember, just to teach them a lesson, nothing could go wrong there...), he immediately hands that info over to Kraven. In this story however, Kraven still feels cheated by Osborn and plans to show up at the Coffee Bean. It's difficult to rationalize these two sets of panels within continuity if we assume that the events of Amazing Spider-Man 1996 Annual occur after Amazing Spider-Man #47. 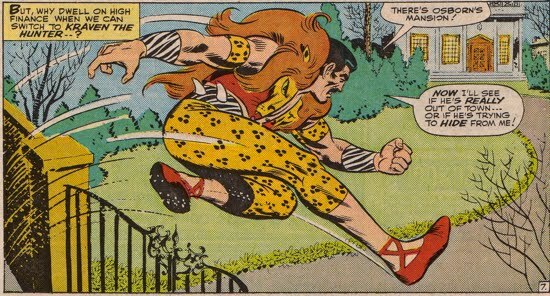 The presumption is that Kraven would kidnap (or attack?) Harry, in order to get leverage on Norman. That, by the way, is the exact same thing he did in Amazing Spider-Man #47. It's irrelevant though because he doesn't even reach the Coffee Bean to snag Harry because Spider-Man intercepts him. During the course of the scuffle between Kraven and Spidey, they come crashing in through the window of the coffee shop. Eventually Kraven reaches Harry but realizes that there's no honor in terrorizing a 'sniveling jackal' (aka Harry Osborn). Later Kraven goes right to the source, Norman Osborn, at his Osborn Manufacturing office. Kraven finds a much different Norman waiting for him, not the confused/uninformed father from Amazing Spider-Man #47 but rather a conniving snake with a proposal for the hunter. After revealing to the Hunter that he was aware of the snitch Joey Ears and that he intentionally baited Kraven out into the open, Osborn offers him his $20K as well as an alliance. He assures the hunter that he will someday control a vast worldwide empire. However, Kraven feels dishonored by Norman’s recent actions and ends their brief alliance. The revealing aspect of this scene is that it appears from Norman's demeanor as if he's aware of his ties to the underworld and possibly even his Goblin persona. We know that he relapses in Spectacular Spider-Man Magazine #2 next, and that he was 'normal' prior to those events but this certainly begs the question of how often Norman oscillated in and out his amnesiac-state. Perhaps there were times when he partially regressed but didn't go full Goblin-mode. Let's close out this section with two bits of trivia from the events that took place during this chapter of Osborn's life. First, in Amazing Spider-Man #47 when Norman meets Peter for the 'first' time. 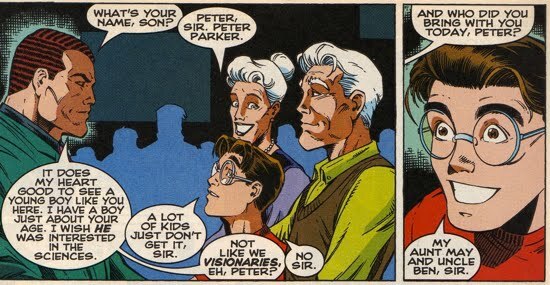 Interestingly, this could be viewed as a continuity flub because Norman had supposedly met Peter already in the retconned story featured in Peter Parker Spider-Man minus 1. Certainly a great deal of time passed between those two events, so its possible that Norman had just forgotten that he had already met him. Second, Norman Osborn and Deadpool would eventually form an extremely antagonist relationship, but if you're keeping score you'd realize that they had actually met years before they first learned to hate each other. In Deadpool #11, the merc with a mouth is transported back in time to Forest Hills around the time of these events (ie, Amazing Spider-Man #47). Deadpool diverts the real Peter Parker, then assumes his identity using Chameleon-like tech. He eventually fights Kraven and saves Osborn (just like Peter did) acting as an (almost) seamless substitute for the real Spidey. For a deeper look into those events, check out this page.